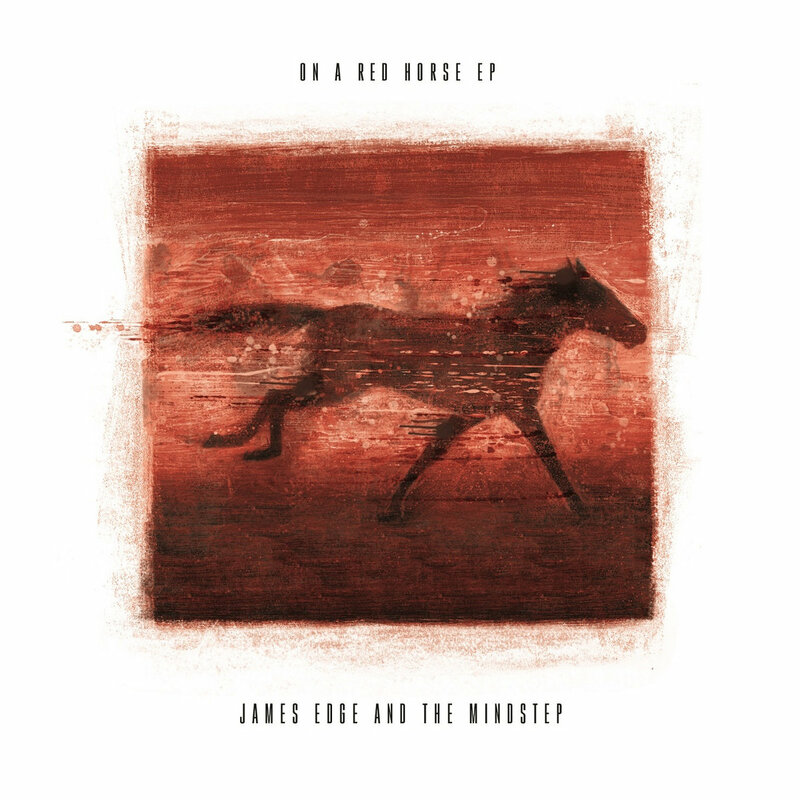 for the single, On a Red Horse (from the E.P. of the same name). The vivid, unforgettable video imagery will stay with me a long time (go watch it on YouTube) but it is the music and sound that stays with me too. Not like any other group out there: there is experimentation, unrehearsed performances and a wonderful fusion of Jazz, Indie; Pop, Rock and pretty much every other genre! One of the most immediate and original musical forces I have witnessed in a long time- my imagination was seduced and I have been compelled to follow the group. James Edge leads the musicians and is the man at the front- putting the words and lyrics to the colourful, thought-provoking songs. Curious to know more about the musical process and inspirations (of Edge); I caught up with him ahead of the new track, Four Two Four. For those new to you and James Edge and the Mindstep- can you tell us how it all came together? Really it started with me writing songs. I never particularly intended to perform them, but ultimately it was the only way of getting them out there – it seemed a shame, once I had some I felt were quite good if no-one ever heard them. So around 2009 I started gigging, sometimes solo and sometimes with various great musicians I knew. Out of that came the first album (In the Hills, The Cities). “The Mindstep” at that stage was a loose collective of about 10 people – a combination of musical friends and sessioners (sic.) I knew and loved from other records and had managed to get involved. A 10-piece chamber orchestra is pretty unwieldy for gigging (we’ve not played any of the South Bank venues, but fingers crossed maybe one day…), so for all the live stuff that happened after the recording I took Andy (double bass) and Avvon (drums) and we reworked the larger songs down to arrangements for the trio. I found this setup and playing live with Andy and Avvon, who are both incredible players, very inspiring and we found the sound of the second album together. Machines He Made, the second album which is out in December, very much evolved as a result of the sound we were making together and that’s why we were very keen to record the three of us live, singing and all, for the album sessions. I can imagine touring must be quite a memorable and eventful experience. Do you enjoy that side of music and how do crowds react to you guys in general? I really enjoy playing live. We like to mix things up a lot and keep things very free, with space for everyone to improvise and for new things to happen in every song, every time we play. One of our more memorable experiences was the first time we played Jacob live. We were headlining at Dublin Castle; I finished writing the song about 30 minutes before we went on stage, wrote charts for Andy and Avvon to improvise to; gave them a sort of verbal overview of what it should sound like and we played it with them never having heard the song before. Things like that are great fun and obviously pretty scary. It’s challenging playing some venues as a quieter act. Quite often people have come for a general night out and not specifically to listen to a band or have come to see another band on the bill. I know a lot of bands and soloists get a bit angry about audiences talking during quiet gigs, but I sort of see it as our responsibility to win people over. If we’ve managed to make 100 people quieten right down and sit in silence and listen I know we’re doing our job. Thankfully that seems to happen quite a lot these days so hopefully, it’s a sign we’re doing something right. On a Red Horse was your previous E.P. and one I loved listening to. It was quite different to anything else out there. What influenced the songs and the themes across that E.P.? The E.P. came about through my relationship with Folkstock Records who are doing amazing work getting unheard Folk, Acoustic and all sorts of other music heard. Folkstock wanted to release a selection of our tracks – three older ones from the first album and three from the forthcoming new album as a sort of introduction. In terms of the track-listing; Helen from Folkstock curated it and I was keen for her to select the tracks she thought would work best and tried not to input. I think she did a great job and the fact that we got our first radio plays on 6 Music and Radio 2, as a result, are a testament to that. Partially because the tracks come from two different eras; the E.P. feels quite diverse to me. The themes range from the very personal to the political, and musically it has three-minute Pop songs alongside quite difficult, scrunchy chaos. Four Two Four is your new song and is getting a lot of love already. What is the story behind that track? In terms of albums or future E.P.s; can we expect a new James Edge and the Mindstep record this year? Yes. The second album Machines He Made is out 6th December on double-L.P., C.D. and download. There are then some other songs from the sessions I’d like to release on an E.P. next year. Who would you say are the musicians most important when it comes to the music you make; those that have inspired you most? The list of well-known bands, musicians and composers is probably endless. I love a bit of everything really. But lately, I’ve noticed how much the people I know who also make music have influenced me and also the people I’ve been collaborating with over the last few years, in this band and others. A lot of food for thought came out of the work I do in my other band Nya Shelley. The engineering and session work I did for Chris Bellis-Wright (Mindstep electric guitarist on the 1st album) over the last few years and from playing with the guys in this band. I noticed Radiohead is a shared love. What is it about the band that captivates you so much? What were your views on their current album, A Moon Shaped Pool? It’s the tireless need to innovate I think; however successful or otherwise one might think the results at any particular stage are. I really enjoyed A Moon Shaped Pool and have sworn off it for a bit until my vinyl copy turns up. I feel OK Computer, especially, is a big inspiration. What was your reaction when that came out and how influential do you feel it has been with regards modern music/bands? I think it’s pretty inescapable if you play and write western guitar music in this sort of idiom. Even if you’re not a fan, half the people who directly influenced you probably are fans. For me it’s one of a number of records that however much I might wish it were less obvious; will probably always come through a bit in what I do because it’s in the subconscious. Like Solid Air by John Martyn or Blue by Joni Mitchell. It probably also doesn’t help that I sing like a girl. That’s always going to bring the Yorke/Bellamy/Buckley comparisons- though I don’t feel any are deserved. I don’t really consider myself a singer – I just got started because I had to sing my stuff because no one else was likely to. Compositionally; James Edge and the Mindstep are very original and not rigid in any sense. Do you think it is beneficial having that loose, inventive way of performing? Do you feel other bands/artists are a little too predictable and ‘safe’ when it comes to the music? Thanks very much! I think there are pros and cons; you run the risk of being seen as impenetrable and or pretentious obviously but I just had to make a conscious effort to embrace that and not second-guess myself. The theme is very much ‘if it feels right; do it and the chances of anyone hearing it are slim to none anyway, so who cares’. Really that’s as unpretentious as it gets – what possible reason is there for an unknown band to write music they don’t believe in at the moment? With that in mind, I’d find it hard to accuse another band of being safe and predictable – by and large, people are making honest music that they believe in and huge swathes of it are amazing- more than we have a hope of experiencing. My passion is for adventurous music but I also like a perfect 2-minute Pop song as much as the next person. I think where I get annoyed is when you see a band doing down a mainstream artist, for example, for being safe and predictable and you just think – what is it you think you’re doing that’s so different? I think it’s always good to have in mind that however cutting-edge you think you are you’re probably pretty dull and pedestrian when viewed from somewhere else on the musical spectrum and use that thought to try to push things forward a bit. Judging the nominees for the Mercury Prize; it appears there is a leaning towards more socially-driven, political records. Do you think that is a sign of things to come in the industry? What were views on the nominations? Explain a little about the creative process. How do you songs come together? Is it composition-lyrics, lyric-composition; do you specifically set time aside to write new material? It’s a bit of everything. I do a lot of musical and lyrical sketches but 90% of the time if they don’t come to something resembling a song within a few minutes they are likely to stay on the cutting room floor. A lot of it has to do with whether I get a sense that a sketch can be great and will fit the aesthetic of the current material. If so I will probably develop an obsession with it, start listening to it in the context of other songs from the album or set-list or whatever project I have in mind and developing it further. I work in groups of songs and how they interact to a degree which is why I will probably continue to produce larger scale album-type releases while the album supposedly dies. It’s just what I enjoy. Once a song is finished, sometimes before if I want to get a vibe fixed, we’ll play it as a band and get a sense of the arrangement for the trio. Avvon and Andy write and improvise their own parts unless I have something very specific in mind like the bowed bass solos in On a Red Horse. We’ll then start playing it live and develop it further through risk-taking and playing off each other at gigs. When it comes to recording: for the new album we recorded live performances of the three if us and about half the songs we’d never played together before. This was a conscious decision to capture some of that fear and excitement. Once we had the trio recorded I then had a think about if any more arrangement was needed and I wrote string parts for a few songs which my usual players came and played. Composed, notated arrangements are a very big part of the process for me but obviously, the needs of each song are different. Looking back on this year so far; which memories stand out to you as especially fond? Releasing the track and video On a Red Horse with Folkstock was great. It was terrifying because there was an awful lot invested in it emotionally but it went better than I expected overall. Your music videos- especially for On a Red Horse’s title cut- are defined by arresting visuals and wonderful conceptions. Do you think the music video, as a concept, is being overlooked or under-appreciated by a lot of modern musicians? How important is that side of things to you? I think the music video as a medium has been very important to me as a listener in the past, but I don’t feel like it’s the same thing it was because of how things have moved on. We consume music very differently now to how we did in the ‘90s, which I think is where the music video peaked for me. So I think functionally it serves a subtly different purpose now to what it once did and expectations are different, but artistically it certainly still presents the same opportunities. Can I think of any recent videos that I hold on a par with Come to Daddy or All Is Full of Love? Probably not but that might just be because I’m far less aware of music videos generally than I used to be in the MTV age. On A Red Horse the video came about similarly to how the music came about – it occurred to me so I made it; I hadn’t seriously considered making a video until the specific idea for the story (such as it is) popped into my head whilst reviewing a board mix on the Tube one day. For any new band or musician coming into music right now; what advice what you offer to them?